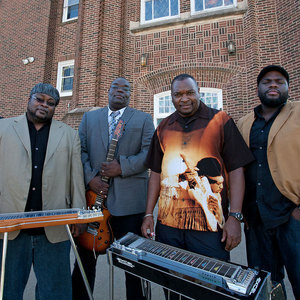 The Campbell Brothers present a Sacred Steel: African-American gospel music with electric steel guitar and vocal. This tradition is just now emerging from the House of God Keith Dominion Church, where for over sixty years it has been an integral part of worship and a vital, if little known, American tradition. As the music moves from sanctuary to concert hall -- including the Hollywood Bowl, the Kennedy Center, Brooklyn Academy of Music and Symphony Space -- secular audiences are now able to appreciate a performance both devoted and rocking. Pedal steel guitarist Chuck Campbell and his lap steel-playing brother Darick are two of the finest in this tradition. Rounding out the band, which has been playing together for nearly two decades, is a high-energy rhythm section featuring brother Phil Campbell on electric guitar and his son Carlton on drums. Katie Jackson's classic, gutsy gospel vocals bring the ensemble to a level of energy and expression that defies description. The Campbell Brothers present a compelling, rich variety of material from the African-American Holiness-Pentecostal repertoire with a new twist: the growling, wailing, shouting, singing and swinging voice of the steel guitar, played as you have never heard it played before.